Dual beam FIB-FESEM instruments are a tool gaining increasing adoption in manufacturing, process development,and failure analysis due to their versatility and precision. The use of a focused ion beam (FIB) creates a very finely focused beam of ions from a reservoir source that can be rastered, focused, and controlled with electrostatic deflectors and lenses. While different ion sources are available for specialty applications, Gallium is a common ion used in these instruments. 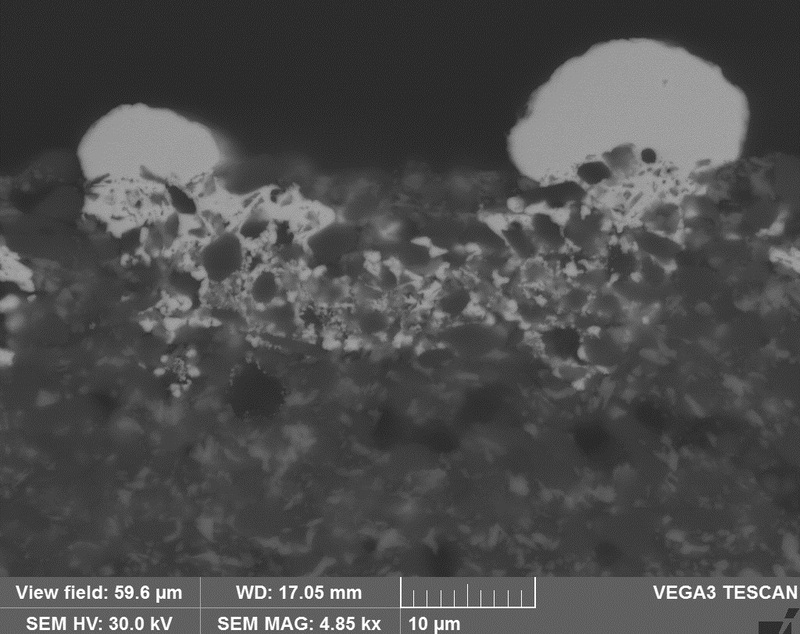 While the ions can be scanned over a sample surface to image the material with secondary electron generation, similar to an SEM, the larger mass of the ions impacts the surface with a much larger amount of energy than electrons from an SEM source. This provides a means by which the sample can be altered, shaped, prepared, and then analyzed for a host of purposes. Samples can be cut, cross-sections can be created, and through the use of injected gas precursors, materials can be deposited on the sample to create controlled structures or create patterned conductive paths to edit or alter micro-circuitry. The addition of a high resolution SEM column along with the FIB creates a uniquely powerful analytical platform. Samples can be mounted, sectioned, probed, and imaged all in a very rapid, precise analytical time frame. 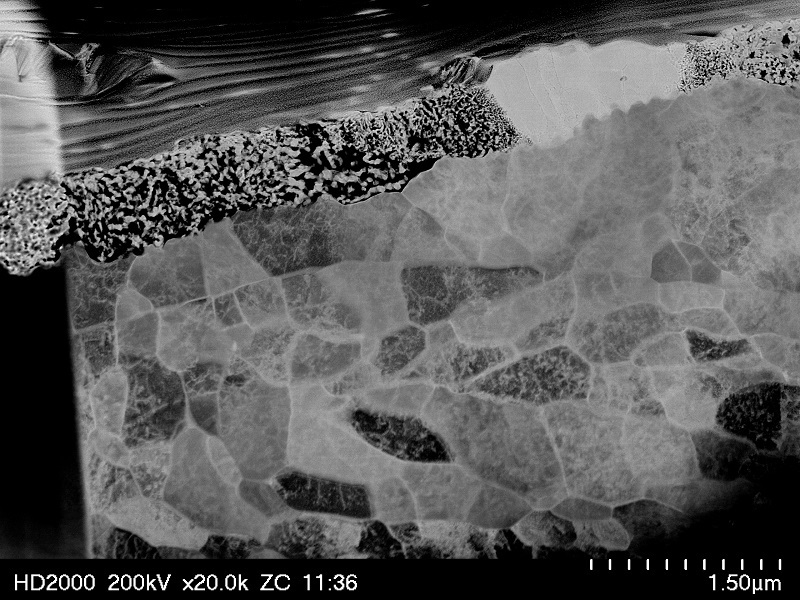 The advantage of high magnification of the FE-SEM, good material contrast, and low voltage imaging performance allow for very fine structures in composite materials to be examined. The use of an electron beam also allows for additional analytical techniques, including EDS, EBSD, and BSE imaging. 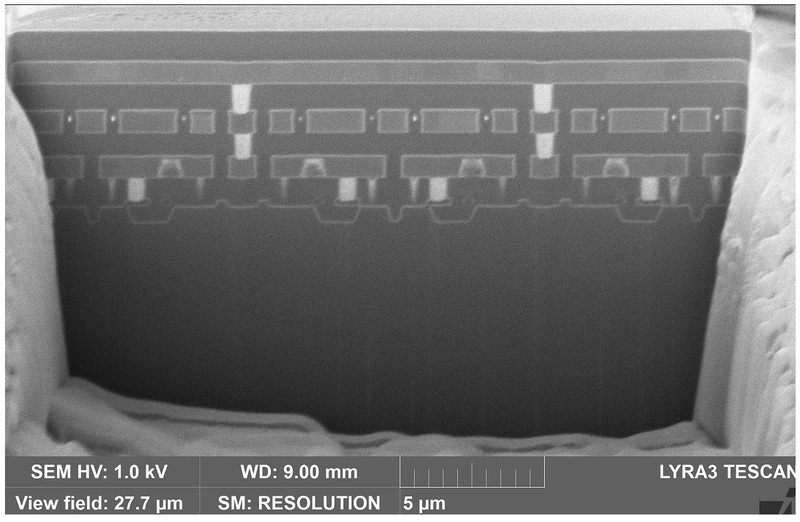 This imaging precision also allows for easy preparation of extremely thin, precise TEM section samples in a variety of materials. All of these techniques can be combined to provide three dimensional analysis, using serial tomography sectioning with the high resolution ion beam, in order to provide voxel resolution under 10 nm over a large volume. Advanced MicroAnalytical's advantage in providing FIB-SEM service allows our range of scientists to leverage these powerful analysis methodologies using our broad range of experience across a multitude of industries. Analysis of semi-conductor devices for failures can be done in the same day as 3D-tomography of catalyst particles in a fuel cell membrane, and performing crack propagation analysis of high tensile steels with EBSD can be done the next day. Our dedication to serving as a resource to our clients in a variety of fields allows us to deliver the best analytical services to clients on demand. Cryo FIB available on request.